What a difference a dial makes! 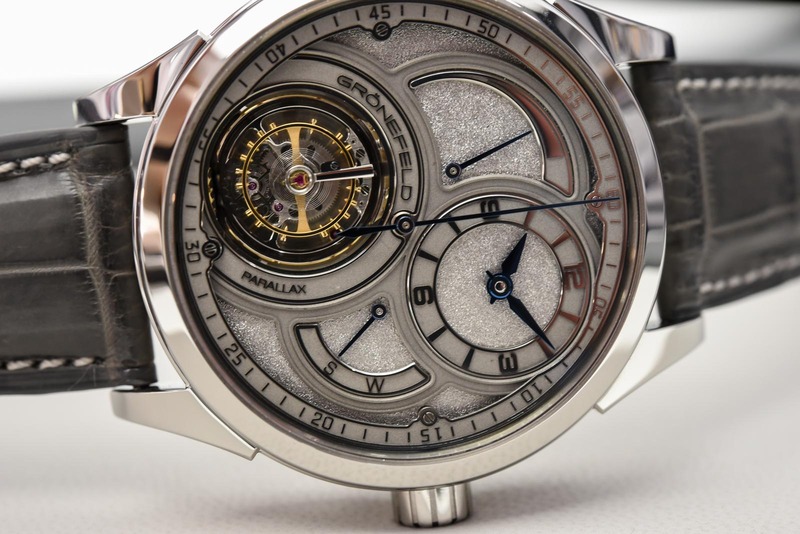 When Grönefeld unveiled the Parallax Tourbillon in 2014, it was the third watch produced by the Horological Brothers, Bart and Tim Grönefeld. 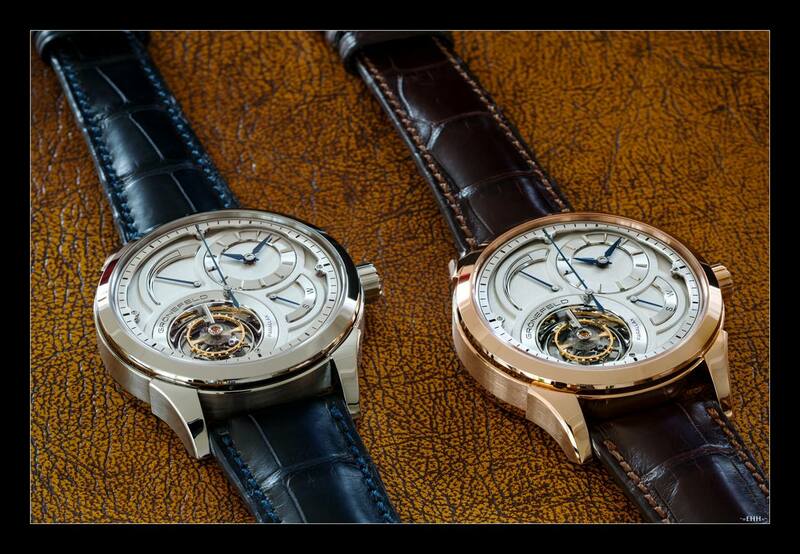 After the GTM-06 (Grönefeld Tourbillon Minute Repeater) and the One Hertz, they wanted to showcase a large tourbillon. 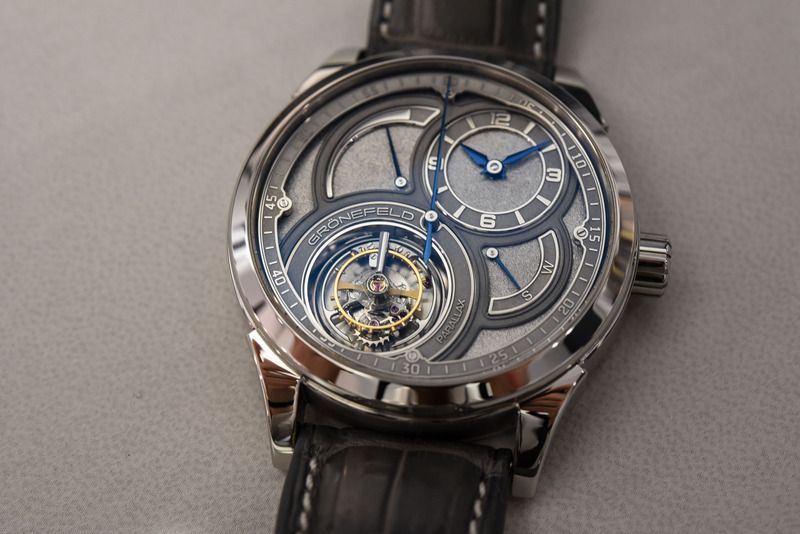 One that would hover over the dial, or at least on the same level as the dial, so it would have all spotlights on the perpetual dance of a tourbillon. 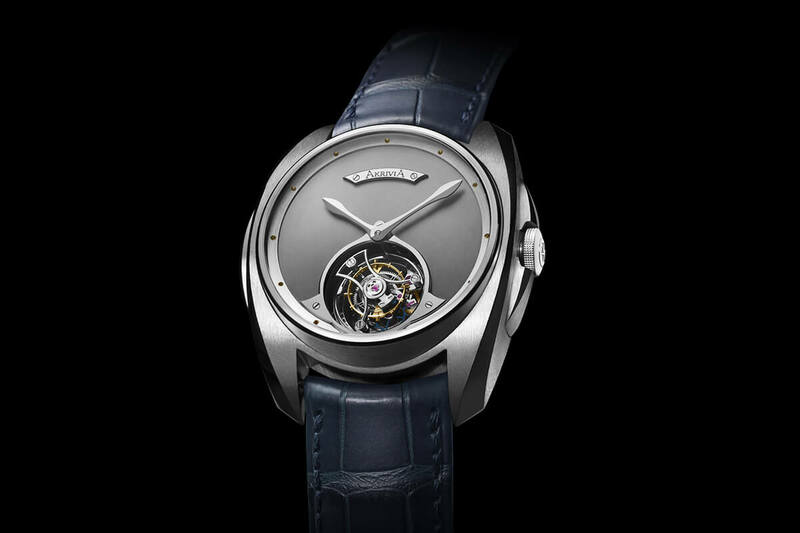 With the new tremblage dials, the emphasis is still on the large tourbillon, while the dial showcases the masterful art of hand-made tremblage. 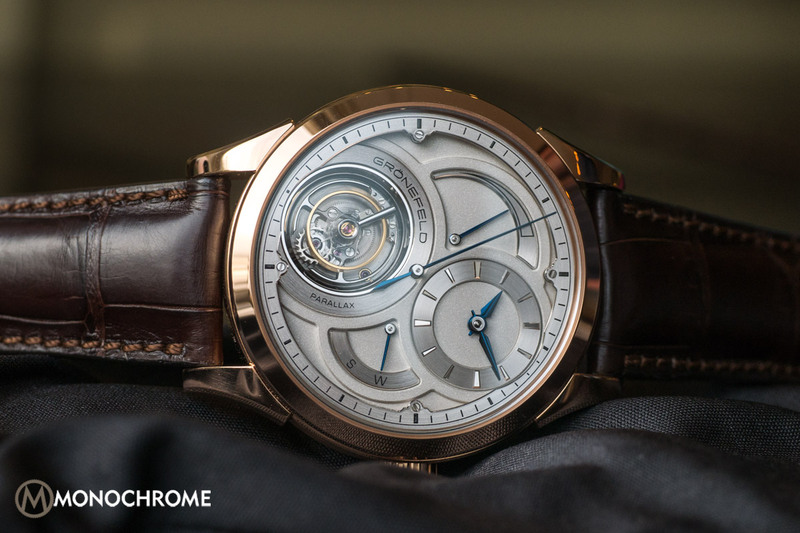 Let’s say the large tourbillon has gotten an even better backdrop. Don’t get me wrong, I’m not saying that the other dial options aren’t very nice. They are! Especially the salmon colour dial looks incredibly good, and like everything coming from Grönefeld, the quality is absolutely sublime. The new tremblage dial is again another showcase of what the two brothers can do, and how incredibly talented they are. Together they design their own watches, they design the entire movement (only the official technical drawings are done by someone else), hand-finishing every single part (angling, polishing, sand-blasting, graining, black polishing) and the time-consuming art of tremblage. Tremblage can be achieved in various ways. 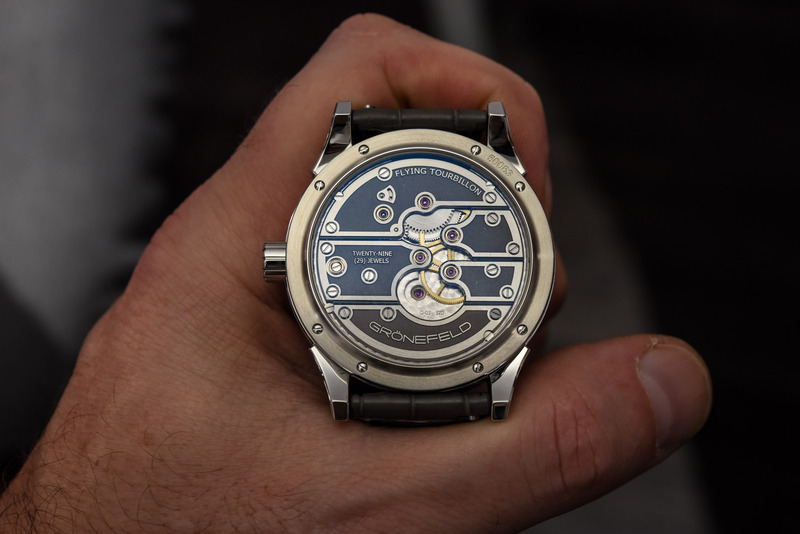 The usual method can be admired on several dials by A. Lange & Söhne (see here, here and here) where they go under the moniker ‘Handwerkskunst’. This method requires a specially shaped burin, which is used to create tiny incisions on the dial’s surface. These cuts are made, one at a time, more or less randomly and in different directions. All these randomly placed micro cuts create a beautifully detailed and textured dial. This is extremely time-consuming and can only be done by a very skilled hand. The depth of all the cuts must be more or less equal. If one of these cuts is too deep for instance, the engraver has to start all over again. Grönefeld employs a different method of tremblage using a hammer and a (sort of) chisel. This is probably the reason why they call it a ‘steel hammered’ dial. This might sound brutal, but the result is a nicely textured dial. 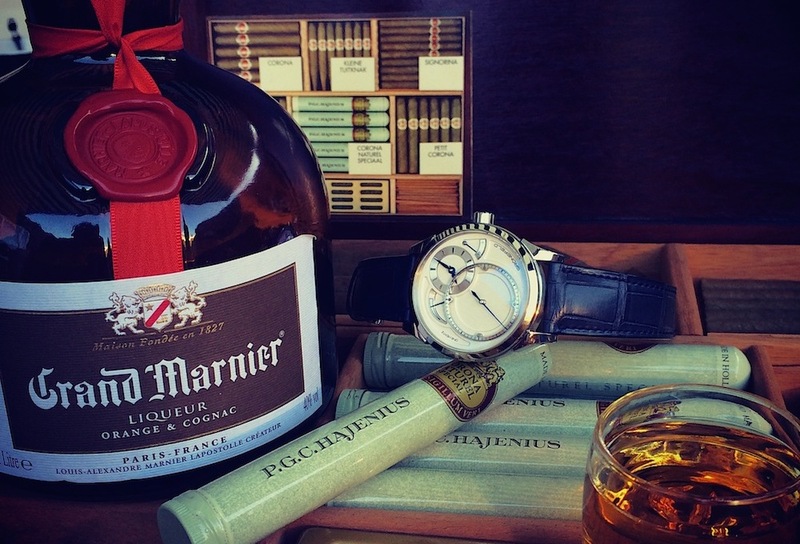 Since every dial is hand-made, every dial is unique. And similar to the other method used to make tremblage dials, the depth of the hammering has to be more or less equal across the dial. It’s of great importance to achieve a consistent texture. Because of the very time-consuming nature of this manufacturing process, Grönefeld will only produce five of these dials. The name Parallax is derived from the precision of the readability of the central seconds hand. The word parallax is defined as the apparent change in position of an object when the observer changes his own position. To minimise the possibility of error due to parallax when viewing the seconds hand from an angle, the hand is placed exceptionally close to the outer chapter ring with the seconds track. A very nice addition is that the one-armed balance wheel bridge always runs parallel to the central seconds hand. 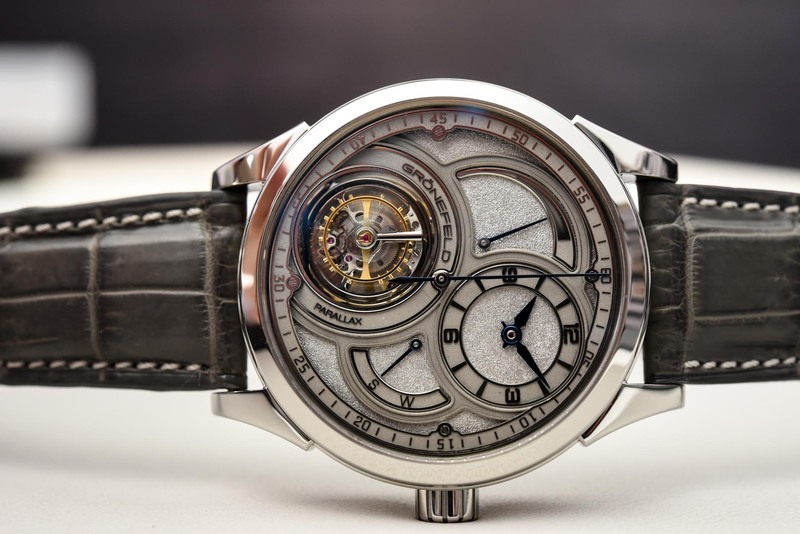 On the Parallax, the one-armed balance wheel bridge always runs parallel to the central seconds hand. Now back to the watch at hand… err.. in my hand. The Parallax is a watch that we’ve described before (see here), so I won’t go into all the technical details and will just highlight the most important ones. First of all the basics: the Parallax measures 43mm in diameter, 12.50mm in height and is water-resistant to 30 meters. 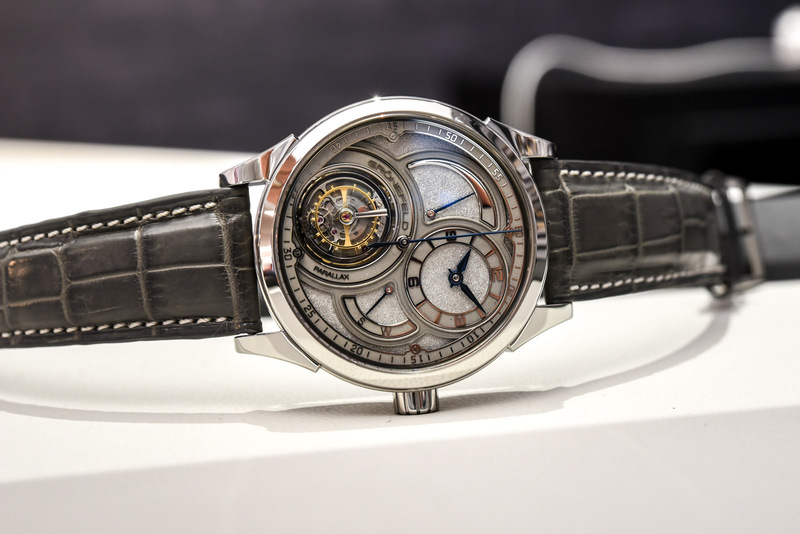 Inside the case is calibre G-03, designed and developed by Bart and Tim Grönefeld, and the raw parts (ébauche) have been produced by Audemars Piguet Renaud et Papi (APRP). 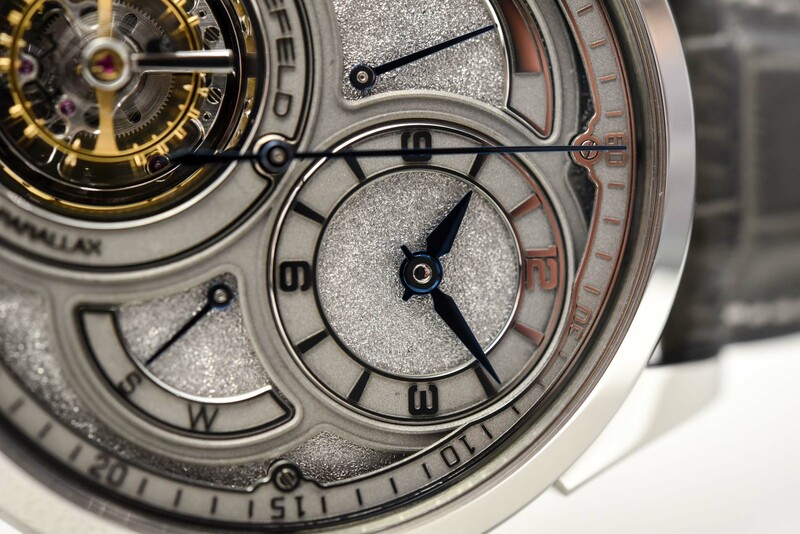 This movement is rather unique, as all movements from Grönefeld are, and comprises stainless steel bridges. 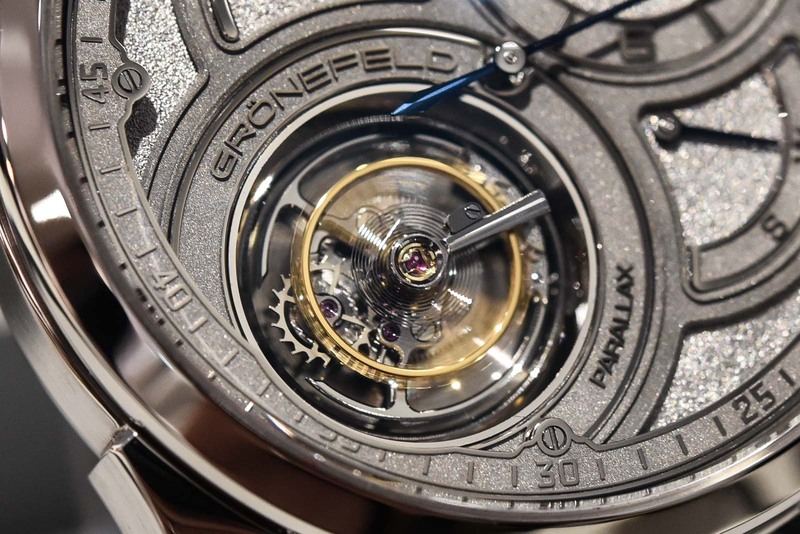 I won’t say that Grönefeld watches are the only watches in the world with stainless steel bridges (you can find the occasional steel bridge in a few watches), but having all bridges of the movement in stainless steel is quite unique and a typical trait of Grönefeld. These stainless steel bridges are much tougher than the German silver bridges that pretty much all other high-end watch manufacturers use. This means that they won’t wear out as fast as the German silver bridges (mainly noticeable around axes and screw holes.) On the other hand, these stainless steel bridges are pretty hard to finish because stainless steel is harder than German silver. But… they look awesome! 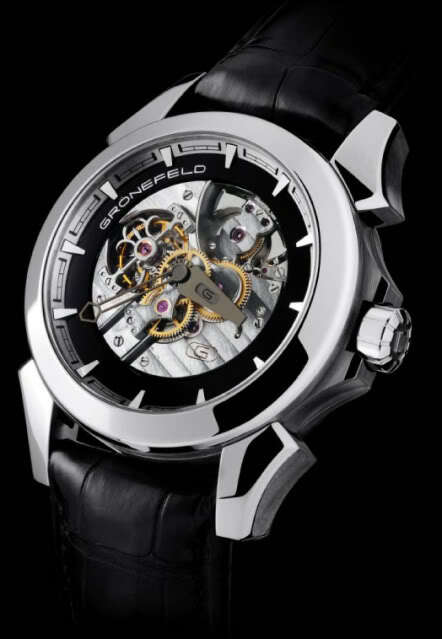 When Grönefeld finishes them, they display a striking high-contrast radiance. More information at the Grönefeld website here. Impressive, busy, complete and very expensive. I do like the unique styling, and the dial is terrific but find this trend of slapping on a big tourbillon for visual and technical interest disturbing.